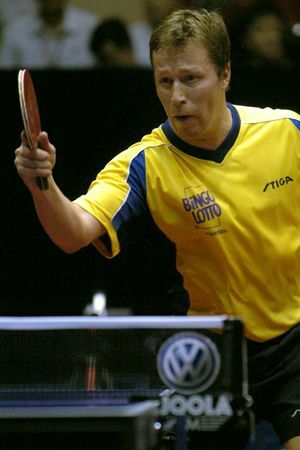 After over 20 years at the top, is Waldner feeling the strain? I miss table tennis from the eighties – the decade in which I started to play seriously. It seems to me that back then there was a wider diversity of styles among the top players than there is today. There were blockers and choppers and penholders and loopers and hitters all vying for the titles, with a number of interesting match ups occurring at the various tournaments. I can’t seem to get quite as excited about watching endless matches between two glued up power loopers, whether they be shakehand or penhold. Take a look at the players below and see if you can name their modern day counterparts. Now JO Waldner – still magic! The Power Loop Rules, OK? It seems that the modern game has evolved so that the speed gluing power loop dominates. I understand that this is the natural evolution of the game, which has been brought about by refinement of technique, improvements in rubber and blades, and the use of speed glue. I also realize that many players will say that this is simply the way of the future, and the ruling body of the sport should not interfere with how table tennis develops. Personally, I believe this attitude is wrong. I believe that table tennis was more interesting to watch back in the days when other styles of play could survive in the top ranks. I would like to see a variety of styles in the top 100 players, with no one style dominating the others. If one style gets to be too powerful, then steps should be taken to cut back its advantage so that all styles can survive. Otherwise we are faced with the situation that the one style that is best suited to modern technology and equipment will kill off all the other styles, and we will have match after match that is pretty much the same. At present, it looks like the power looping style is killing off all the others, but imagine if technology comes up with something that gives the pips out hitter an overwhelming edge. Would we want to watch endless matches of pips-out players smashing the ball at each other, with rallies lasting 2 or 3 shots maximum? At any rate, I certainly don’t want to watch match after match of power-looping rallies and nothing else. Limit the amount of spin and speed that can be put on the ball. The power loopers are getting incredible amounts of spin and speed which is driving out the other styles. A suitable cap on the amount of speed and spin that can be generated would level the field out a bit. Have regular evaluations of the styles of the top players. If 80% of the top players are power loopers, what does this tell us? Probably that this is the style that wins tournaments. Why can’t we try to aim for a sport where a number of styles can all be competitive? I do realize that this opens a can of worms in that we then have to decide which styles should be recognized as being worthy of survival, but I’d rather pick eight styles that I’d like to survive equally in the future, than have one style being king of the hill. I know, I know, it will never happen. But a guy can dream, can’t he? Take a look at the styles in (3) above. I think it’s a pretty good mix of playing styles and techniques. Just imagine for a moment that in the next World Championships, that the final 128 men players had about 15-20 players of each style mentioned above, all about the same level (don’t worry about the exact maths please). Don’t you think that there would be some wonderful matches to look at? Do you agree? Disagree? Have a comment you’d like to add to this page? Add your thoughts below! Hi, I really liked your article on how different styles are dying out because of faster and spinnier technology. I too miss watching a variety of styles especially defenders(I’m a penhold inverted hitter). It seems unfair that short and long pips have many restrictions when those styles are at a disadvantage. I think the original idea is that non-TT players would be more interested in the sport if they saw longer rallies and more looping, making the sport more physical than technique/strategy driven. I’m not all together sure how looping became the ideal and all other strokes became inferior. I’m not sure if non-TT players saw looping rallies if this would really get them interested in the sport, I do want the sport to become more popular. For americans I think the ping pong ball and the table dimensions are too small for them to bother with, compared to football, basketball, baseball. As a player, I know for me having less styles makes the sport less interesting because it’s the learning that keeps TT interesting for me. I guess my vote is not to try to cater to non-TT players as I don’t think that they can be convinced to like TT more and to keep it interesting for people who are already playing. I did like the idea of limiting the speed and spinniness, just as there are limitations on pips to bring back variety and make a level playing field. How does one determine what equipment is okay and others not? What about not having restrictions on equipment? My own opinion is that the ITTF shouldn’t stop technology, if rubbers are getting too fast, or long pips getting too irritating, WHO CARES? This way they are ruining the whole sport, isn’t it cool to see someone with ButterFly Long Feint chop a ball that comes back to you zig zagging. I think people like to see nice or cool ball returns, not just hard looping a ball, but also a zig-zag chop. They also say that if they don’t do anything about development of better rubbers, the sport will be too technical, but that’s the way it goes, things won’t stop growing, they will evolve further. Take computers for instance, they also get better all the time, why not let that happen to tabletennis? I think the main reason because the do all this is money, they introduced so much things to slow down the gameplay, like 40mm balls, 11 point games to keep the excitement, so the public won’t get bored so fast. But isn’t it the sport itself that matters, it’s wrong to change a sport just for the public and I don’t think that the public’s going to care if rallies won’t take long, sure, in lower class tabletennissing this will be the case, but on top classes I bet people sure can handle fast balls and you will see much nicer, faster and longer rallies. I for myself love the 38mm’s and 21 point games, because this way it’s much better to tell if someone’s really better than you are. Because handling smaller balls requires more skill of the player because the balls go faster and 21 points make sure noone gets lucky and wins 5 points by luck and is already half way up to winning the game (hope you understand this). Also, new and better material forces the player to get faster, react faster and hit faster himself, that way, the player has to train in order to stay in the competition. And as a final note. If I want to win, I’d rather win in a rally of 2 balls than instead of 10. I’m sure you have more experience in tabletennis than I have so I am wondering what you think of the ITTF’s policy on restraining. I must admit that I tend to agree with the ITTF’s policy – but there are two main problems which they have admitted. Firstly, it’s very hard to test the rubbers and blades that you have restricted, and secondly, it’s difficult to decide what type of table tennis matches are the best, in order to choose your restrictions. I agree that all sports naturally evolve – but I guess that I personally don’t like the way I see the sport heading it terms of spin and speed. There will come a point where the technology becomes more important than the player – and I think we are rapidly approaching that point where the sport will be table tennis in name only. My next point would be that if there are to be limits on the technology in any sport (such as the red/black rule or the 4mm sponge rule etc), then these rules should be there to provide a desired and agreed upon result, and if they don’t work, then they should be scrapped. Finally, I think the main problem is this – most of us know good table tennis when we see it – but making the corect rules and restrictions to give us more good table tennis and less bad table tennis is not an easy job. I like your basic idea, that is to make TT more interesting. However, restricting progress never helped anything, nor any sport. Seemingly, tennis handles this subject better. ITTF pitianer rules on pimples and the like degrade the sport and the issuing organisation makes itself a loughing stock. If any restriction could be applied I would vote against speed glueing. Not because it is faster or spinnier, but because it creates a wide gap between the spectators, that is the TT playing public, and the performers. Ask the guestion, who is looking TT as a spectackle. The majority are those who play or played the game. Anything that alianates them is a shot in the foot. The idea to make TT a spectackle for coach potatoes and cash in 100’s of millions of dollars for TV rights is utopistic. It would be nice but it will never happen. Better would be if the international TT federation would make efforts not to reduce, but enlarge the grass root basis. What was the result of their new rules? I did not see anything positive! Would a ping pong ball as big as a luftballon help in reducing speed and making easier fun for those who never played the game? If the size of the non-playing TV audiance is the measure, ITTF would be better off to forget to regulate pimple length, wood percentage, blade thickness, etc. and take care about the real show business. But it has nothing common to TT which is a real sport in its true classical (greek) meaning. First of all, thanks for the awesome site. After reading this article I shamefully admitted to being one of the power loopers you were talking about. However, I do have great appreciation for other styles and I admit that it gets boring playing always against other power loopers. I find it refreshing to play against the occasional chopper or blocker, etc. and it really keeps me on my toes. As for banning long pimples rubber i think that it is pure ludacris for the reasons mentioned above. I feel that variety is what makes table tennis interesting, and indeed many players i knjow quit simply because they got bored of playing the same type of people all the time. First off, great website and great articles! Keep up the good work! I would like to make three comments regarding the evolution of table tennis and playing styles. First, I think one thing that has changed the is the same thing that has changed other sports, and that’s athleticism. More and more emphasis is placed on athleticism with each successive generation. I think this is responsible for the growing number of “power loopers” in the game as opposed to technical or defensive players. The idea of a power game makes more sense to someone of tremendous athletic ability rather than teaching him/her to win with chops or blocks. Another comment is related to the first in that much of the sport is now (as opposed to more than a decade ago) heavily influenced by the world of information in which we live, specifically as it pertains to marketing and marketing hype from the manufacturers. Not that the equipment description is false advertising, but that it always creates a lust for something faster and with more spin, and the technology is there, and the manufacturers feed from that. The limits are always being pushed higher and higher with faster, lighter, spinnier equipment. (The same can be said for golf clubs, golf balls, softball bats, etc.) If the ball size is increased again, don’t think for a second that the blades will have a speed rating of 13 (on a 1 to 10 scale!) and the harder sponges will get more popular. Lastly, the sport is called “table tennis,” or table “tennis.” Since I first played tennis prior to table tennis (and many tennis players I knew in college were tenacious TT players, as well), my TT game is similar to how I play tennis with a good mix of F/B drop shots, soft well-placed touch shots around the net, and as many F/B drives and loops that I can create opportunities for during a rally. I love playing at mid-distance, but don’t get as many opportunities as I’d like. For those “power loopers” and aggressive “mid-distance” players out there just doing what they do best, I think their style is actually more true to the name of table tennis compared to those styles that are predominantly blockers, choppers, etc. An all-around attack stategy with emphasis on power looping is more true to the table “tennis” name and makes more sense to progress in this direction. Regarding ITTF’s enlarging the ball, banning speed glue VOCs, and restricting blade composition, the only one I have a problem with is the ball diameter. It should remain at 40mm indefinitely so as not to cause older equipment to become antiquated. The VOC ban makes sense from a health perspective, and if the blade composition isn’t regulated it will get out of control and the manufacturer’s will get crazy (most have already!). And for the “senior” players at my local club, let’s leave the pip-out players alone for a change. The main argument the ITTF pushes is changing rules to make games more enjoyable to watch, therefore getting more people to appreciate table tennis and thus increasing the sport. I cannot argue against the goal of such an endstate. I also have no objection to changing equipment standards and rules to reflect changes in time and technology. My contention is the manner in which ITTF wishes to achieve this. I think that on a strategic level, they have it all wrong. The rule changes, especially the equipment changes (banning certain Long Pip Rubbers) create the opposite effect – they will cause numerous players who will use only this equipment to stop playing table tennis. This also contributes to the downfall of established playing styles – ITTF is making several styles extinct with their rulings, not a good thing in my opinion. In many areas of the world, table tennis is not very popular and many people must go a long distance to find other (serious) players. Losing these players seriously affects the ability of others to find players. I will present a controversial, yet simple strategy to achieve the goal of increasing the sport. Why not funnel all that effort, time and money into something much more productive, like getting lots of people actually playing and loving the sport. If more people participate at even the lowest levels, they will certainly appreciate high quality table tennis and would be more likely and effective in recruiting more players. This makes it more likely for table tennis to be appreciated and viewed. Increasing the number of players is the way to go. There must be a better infastructure in place across the world. If there were better and more places to play real table tennis, new players could get right to work. Convincing institutions on the value of table tennis and getting them to start programs is a must. When more schools have teams, parents get more interest. Parental interest is an undervalued and underutilized asset. There must be a lot of table tennis players willing to coach for little pay to start it out and companies would benefit themselves by donating more equipment, which would get more players interested in buying more table tennis equipment when they dedicate themselves to the game. We all know how much an equipment junkie buys, yes? I say increase the base of players (and the infastructure as well) and when there are enough serious players, the sport will be more appreciated and the the players themselves will contribute to the growth and viewability of the sport.